With tears in his eyes, Philippine National Police (PNP) officer-in-charge Director General Leonardo Espina pleads for justice and fairness for the 44 fallen Special Action Force troopers in a grim encounter in Mamasapano, Maguindanao last January 25, 2015. 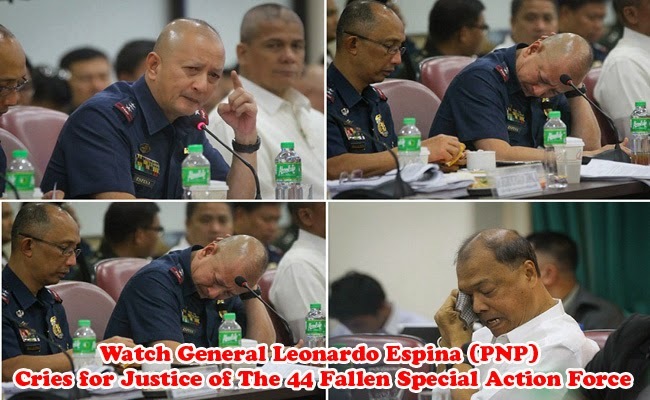 During the investigation in the House of Representatives on February 11, 2015, Espina shared that he was unable to sleep upon receiving the medico legal report for the bodies of 44 troopers. He narrated that Inspectors Rennie Tayrus and Inspector Ryan Pabaliñas di not receive any fatal shots but only gunshots on the feet. However, they died due to close ranged fatal shots on the head with 9mm. Furthermore, he shared that these are only examples of how the overkill had been done as about twenty other troopers suffered the same way of death. One of the troopers was also said to have a chance to survive but his bulletproof vest had been pulled of being being shot close ranged at his body. Espina could not contain his tears as he shares the fact that many troopers among the 44 could have been alive if only they were not killed in close range. He said that many could have gone home to their children if only they were given the chance. It was an overkill and he asked for transparency so he can relay what he knows to his fallen men in the event that he meets them when he dies. He also shared that PNP are peacekeepers and that they were aware of the ongoing peace process, however, he wanted to know why such overkill was done when the mission of the SAF was to get the terrorist who had killed hundreds through a bomb. He clarified that the operation was legal. In the end, he said that it was still sweet to die for the country but he only asked for justice and fairness for his fallen men who could have survived if only not killed mercilessly.